This summer, I was working on an iBook about the hydrosphere. One chapter focused on the Great Pacific Garbage Patch. For those of you who don’t know, there is a “patch” in the middle of the Pacific Ocean (near Hawaii) that collects trash and debris from land that is dumped in by humans or makes its way into the ocean from landfills or run off. 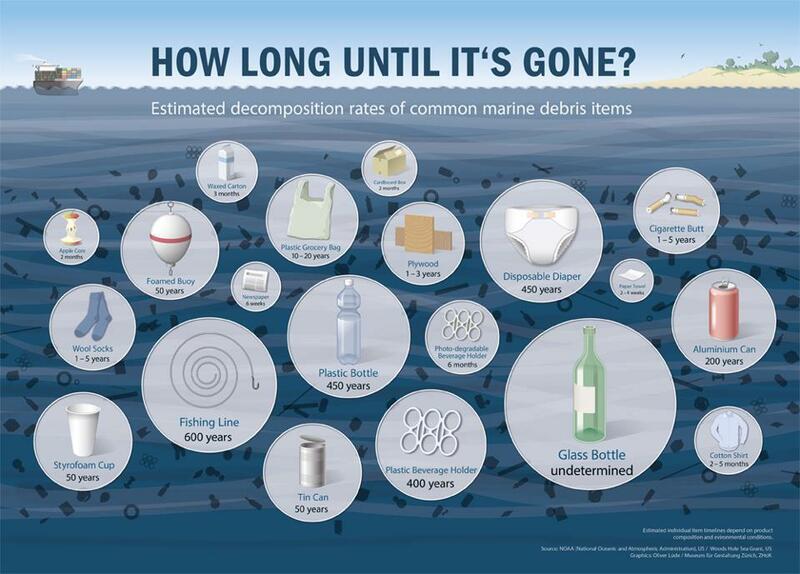 The biggest problem with ocean trash is that the decomposition rates of most of the trash items are very low. Another problem is that it is nearly impossible to remove the patch from the ocean because it would take a constant stream of industrial ships to even begin removing the trash. Removal is not economically viable for anyone. The image below is a great example of decomposition rates. The plastic was salvaged by actual Method employees and volunteers! Method also made a statement regarding their production of the soap. According to the New York Times, the company’s chief greens’ keeper, Adam Lowry, says that “the process was not cost-effective, but that economy was hardly the point. We want to create a conversation about recycling plastics. The real objective is to make the point that we ought to work with the plastics already on the planet.” I don’t know about you, but I find it amazing that this company is bypassing its profit to do something right for the environment. Method Ocean Plastic products are not sold online yet, but will be available in store at Whole Foods for $4.99, and that’s a bargain for the consumer who is looking to make environmentally sustainable purchases. The message still remains: Watch what you put in the trash, because it may end up places where it doesn’t belong. Happy recycling!